Digital video recorder, HD-TVI, DVR, 4 channel, 1920x1080, HIKVISION This model DS-7104HQHI-F1/N support HD-TVI, AHD, CVI and analog videocameras. H.264 compression is with 50% faster than MPEG-4 compression. Surveillance camera kit 2-DT-KIT-2MP , 2 FullHD cameras, DVR and cables Surveillance camera kit that includes all what's necessary for video surveillance of stores, private houses or offices. High resolution picture. Digital video recorder, HD-TVI, DVR, 8 channel, 1920x1080, HIKVISION This model DS-7108HQHI-F1/N support HD-TVI, AHD, CVI and analog videocameras. H.264 compression is with 50% faster than MPEG-4 compression. 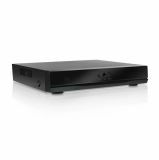 Digital DVR, H.264, HIKVISION DS-7216HFI-ST/SN, 16ch DVR digital H.264, HIKVISION DS-7216HFI-ST/SN, 16ch VGA resolution 1280x1024, 2pc. 2TB HDD Sata, PTZ. USB DVR, EasyCAP002, 4 channel USB DVR, EasyCAP002, 4 channel, suitable for household and industrial application. Video recorder, 4 channel, NVR, HIKVISION This model DS-7604NI-E1/A support HD-TVI, AHD, CVI and analog videocameras. H.264 compression is with 50% faster than MPEG-4 compression. DVR-4 channel, DS-710HGHI-F1/N The DVR device has Video Input and Transmission. It is connectable to HDTVI, AHD and analog cameras. Long distance transmission over UTP and coaxial cable with max. 1200m for the 720p and max. 800m for the 1080p HDTVI signal. Digital 4-channel DVR/HVR model E-CH 7004, H.264 Digital 4-channel DVR/HVR model E-CH 7004, H.264 - analogue cameras - 4CH/D1 или 4CH/960H - IP cameras - 9CH/D1, 8CH/960H, 4CH/720P, 2CH – 1CH/1080P, 1CH/720P+7CH/D1, 1CH/1080P+1CH/720P+2CH/D1 - analogue and IP cameras - 2 CH/D1+(1CH/1080P+1CH/720P) HVR recorder has a Pentaplex function - live, record, reproduction , archive and remote access as well as "Motion detection" - record only when movement is being detected. List Price 119.00лв. VAT Incl. 113.05лв. VAT Incl. 107.10лв. VAT Incl. List Price: 135.00лв. VAT Incl.